There are certain rural carrier provisions that happen around the new Guarantee year and the end of the year. I have summarized them below with links to more information. Pay close attention to anything highlighted, or you may end up being surprised. The new Guarantee year starts on October 13th, 2018. 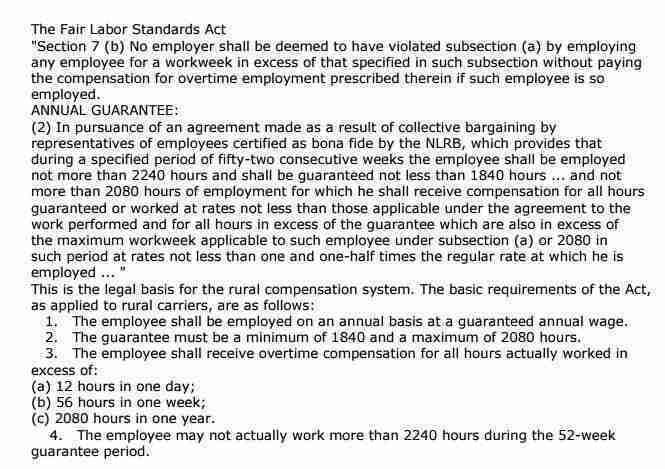 Carriers are paid overtime for all hours actually worked in excess of 2,080, up to 2,240, within the 52-consecutive-week guar­antee period. If a carrier works more than 2,240 hours within the guar­antee period, the agreement under FLSA section 7(b)(2) is considered void, and the carrier must be compensated for all hours worked during the guarantee period in accor­dance with FLSA section 7(a). A Rural Carrier’s pay grows with the size of their route. In certain situations a Rural Carrier may have the additional opportunity of choosing what is called a "high option". This basically means they are requesting to work more hours per week, in order to receive more pay. 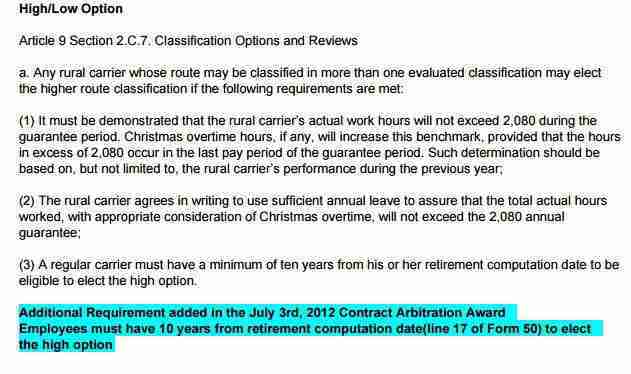 A rural carrier may choose the high option prior to the beginning of the new Guarantee year if certain provisions are met. j. During the period that starts with the beginning of the guarantee period through the end of the designated Christmas period, a regular rural carrier who works the relief day and is entitled to an X day, must be given the X day as scheduled by the Employer within the same pay period in which the relief day was worked. Regular rural carriers shall be prohibited from scheduling a previously earned X day from the beginning of the guarantee period through the end of the designated Christmas period. If the X day is not received with- in the same pay period, the Employer will compensate the regular rural carrier 100% of the carrier’s daily rate of pay in lieu of the X day. The 2018 Leave year ends on January 4, 2018. Any annual days over 55 must be used by January 5, 2018 or you will lose those days. Bargaining Unit Employees. The maximum leave carryover for bargaining unit employees is 55 days (440 hours).